Earthworms are one of the most important organisms in soils. Earthworms mix together different layers of soil and incorporate carbon in the form of organic matter into the soil. It’s within this process of mixing that disperses the organic matter throughout the soil and makes the nutrients held in it available to plants. But their population in soil is threatened by a number of soil and environmental factors. Agricultural practices like heavy tillage operation, intensification especially over stocking, overuse of chemical fertilisers and the proliferation of agri-chemicals also contribute in the reduction of earthworms in soil. 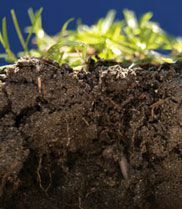 Because of all of the important functions earthworms perform in our soils it is crucial to have a soil teaming with life. Earthworms do not like soil that is too acid, alkaline, dry, wet, hot or cold, their presence is a good indicator of soil conditions suitable for plant growth.Below is an outline of the way in which you can encourage earths in your soil. Earthworms do not like acid soils. The addition of lime raises pH and also adds calcium. Earthworms need a continuous supply of calcium, so are absent in soils low in this element. Earthworms feed on soil and dead or decaying plant matter, including straw, leaf litter and dead roots etc. They are the principal agents in mixing dead surface matter with the soil, making the carbon more accessible to decomposition by soil microbes. Examples of this include crop residues and stubble, green manure crops pasture residues. Highly acidic fertilisers and some agrichemical (especially fungicides) can reduce worm numbers. Moisture is crucial for the survival of worms. They can lose 20% of their body weight each day in mucus and castings. Groundcover such as pasture or stubble reduces moisture evaporation. Decaying organic matter (humus) holds moisture in the soil. In the heat of summer some earthworm species burrow deep into the soil and are inactive until soil moisture returns. Worms need oxygen to survive so a reasonably aerated soil is essential. This explains why worms aren’t present in anaerobic and heavily waterlogged soils. It is difficult for earthworms to move through heavily compacted soil, so keep vehicle and animal traffic to a minimum in wet conditions. Ploughing soil reduces earthworm numbers. Researchers have found that after four years, zero-tilled paddocks had twice as many worms as cultivated soils. However, shallow cultivation may not affect worm numbers. Microbes and earthworms play an important role in the soil ecosystem sometimes referred to as the soil food web. This soil food wed consists of both small and large organisms with the smallest being the microscopic bacteria and fungi that are attracted to the plant exudates and consume organic matter, nitrogen, and nutrients. These organisms hold the nutrients in their body, and when they die they become slow release fertilisers for the plants. They also are food for the second level of organisms that exist in the soil, such as nematodes and protozoa. These organisms are then fed upon by millipedes and earthworms and other organisms. The soil ecosystem has a huge amount of biodiversity. In addition, previous studies have documented earthworm movement toward microbial food sources which shows how crucial it is to promote healthy biological activity in your soil. EM can play in role in this, as a microbial inoculant consisting of bacteria, yeast and fungi that can deliver significant inputs of microbes to your soil. EM will also play a role in stimulating native soil microbes to produce a healthy functioning biological soil, which in turn encourages earthworm activity. In the below video a Northland Dairy Farmer, and Avoca Soil Consultant , Tony Johnston do a soil assessment and worm count to look at the effect of EM on his soil.